These trendy wallets will thrill your guests! They block RFID readers and offer protection from identity theft, a must-have in today's electronic world! Our wallets are the ideal way to store credit cards and identity documents. They are made of an extra tough and strong silver aluminum. They are slim and lightweight and will fit easily into a pocket or purse. The aluminum blocks RFID readers to protect your identity. Inside are seven slots that fold out accordion style. The outside features a ridged surface for an easy grip and the wallet closes with a snap shut action. 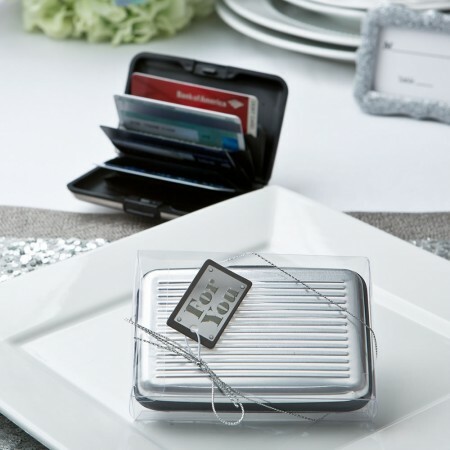 Delight your guests with a trendy and functional favor that they are certain to make use of. Size is 4 1/2" x 2 3/4"